How to prepare for SAP PI/PO technical interview and answer technical questions? Starting a new job might be exciting, but facing an interview is not so much! Especially, if the interview is a technical one. I have done a fare share of SAP PI/PO and ABAP interviews in the past 10 years and would like to share my experience. I wrote this article to prepare you for an SAP PI/PO interview by listing down common questions and answers. How to Prepare for an SAP PI/PO Interview. Make sure to give yourself enough time to prepare before the interview. In the preparation phase, it is important to brush up on your knowledge on SAP PI/PO Architecture and Concepts. Go through each area of PI/PO, such as Adapter Engine, Integration Engine, Mapping techniques, Runtime/Monitoring, etc. and understand the core concepts of each. Understand Architecture and Core Concepts of SAP PI/PO. For the interview to be successful, you should understand the history, architecture, and core concepts of SAP PI/PO, as well as the purpose of middleware. If you know the history of SAP PI/PO and how the architecture has evolved over the years from XI to PI to PO you will be able to impress the interview board. By understanding functionalities of middleware you’ll be able to answer architecture-related questions with confidence. Go Through the Interface You Have Built and Implement Test Interfaces. Over time, we tend to forget technical details of the interfaces or configuration steps. You might have worked with AS2 adapter extensively 4-5 years ago, but it may be difficult to recall the functionalities or configuration steps of AS2 adapter now. Therefore, you need to go through the functional and technical specification documentation of the interfaces you built in the past to brush up on your knowledge. Even better if you have access to the system you built in the past. Simply go through the implementation methods, Message Mapping techniques, Adapter Configurations, Receiver Rules, Alert Rules, etc. Understand SAP PI/PO Node Functions, Mapping Techniques and Patterns. Interviewers focus on Message Mapping techniques, as it’s a crucial part of interface implementation. You should know the use of Graphical Mapping, Java Mapping, XSLT Mappings, and UDFs. It’s crucial to understand the functionalities of main node functions, such as Collapse Context, Remove Context, UseOneasMany, Map with Default, If Conditions, String Node functions, CreateIf, etc. The best way to remember the functionalities is to understand the input, output, and the data transformation of the Node function. There is no need to memorize them in detail, but have an overall understanding of the function. For complex Node functions, such as FormatbyExample, memorize a practical sample. You also need to prepare for questions about advance mapping techniques and interface patterns. For example, Multi-mapping, Message-splitting, Extended Receiver Determination, Parametarized Mapping, etc. Improve your knowledge in common interface patterns like iDoc to File, file to RFC, Synchronous SOAP, ABAP Proxy to File, file to file, SOAP to RFC. Learn about SAP PI/PO Adapter Configuration. iDoc (AAE), RFC, HTTP(AAE), FTP/File, sFTP, SOAP and RNIF configuration are essential skills to become a good integration consultant. Read about the capabilities of B2B Tool Kit adapter types AS2 and EDI Separator as they are widely used in the industry. Improve your Knowledge in Message Monitoring Tools and Alerts. Brush up on capabilities of Message monitoring and Run-time Components monitoring and learn how they changed over the years. Specifically, focus on Message Monitor, Communication Channel Monitor, Channel Independent Log, B2B Log Viewer, and XPI inspector, iDoc Monitor. Have an overall understanding of functionalities of these components and tools. You should also understand the integration-related monitoring tools in SAP, such as iDoc monitoring transaction codes, RFC monitor (SM58), Proxy Message Monitor (SXMB_MONI), Inbound Queues (SMQ1), Outbound Queues (SMQ2), etc. Understand the Different Steps Involved in Configuring Alerts in SAP PI. New SAP PI/PO versions use Component-Based Message Alerting (CBMA) mechanism. Understand the architecture and capabilities of CBMA. You can follow the Alert Configuration steps here. Usually, interviews start with an introduction of yourself. We all know you should mention your name, education background, experience, blah-blah-blah. But for an SAP PI/PO technical interview you need to showcase the highlights of your career focusing on technology exposure. If you have previous experience in SAP PI, make sure to mention the projects and tasks you are proud of. Mention your experience in new technologies, projects for popular brands, complex interfaces you have built. If you are a fresher, you need to have a passion for system integration and show that you understand the concept of middleware. Show your knowledge in Communication Protocols such as FTP, AS2, SOAP, HTTP, etc. What to Do and What not to Do at an SAP PI/PO Technical Interview. My main advice for any interview is to be honest. Nobody knows everything about the subject or has experience in every area of SAP PI/PO. If you get questions on the systems you have not worked with, it’s ok to say you don’t have knowledge in that area. You can always mention your knowledge and experience in related areas. Do not get cornered by trying to explain a technology you haven’t worked on. Know your audience. If you are interviewed by a senior manager or a board of directors, there is no need to mention technical details, unless they ask you. On the other hand, if your interview is conducted by a technical consultant or architect, make sure to showcase your practical knowledge. Always provide examples of interfaces you have built or projects you have worked on when answering questions. List of SAP PI/PO Interview Questions and Answers. Here is a list of common interview questions and answers! What is the difference between SAP PI and PO? Main Components of SAP Process Orchestration? What Is the Functionality of Advance Adapter Engine and the Difference Between the AAE and AAX? To answer these questions, read my article on evolution of SAP PO from XI. What Are the Different Mapping Techniques in PI and What Are Their Uses? There are three different mapping techniques in SAP PI/PO: Graphical, Java, and XSLT. Read about the use cases of these mapping types here. Explain the Concept of Queues and Contexts in SAP PI. To build mapping programs efficiently, it’s necessary to understand the concept of Mapping techniques. In the previous article, I have explained the concept of Context and Queues in detail, with an example. What Are the Receiver Routing Techniques Available in SAP PI/PO? Standard Receiver Determination and Extended Dynamic Receiver determination are the main methods to define routing in SAP PI interfaces. How Do You Set a Dynamic File Name at the Receiver Adapter? There are several methods to assign a dynamic file name to receiver adapter. Learn about them here. How Do You Configure an iDoc Collection Scenarios? For Outbound iDoc collection, you need to provide the iDoc package size in Partner Profile (we20) and select the option ‘Collect iDocs’. In PI side, Sender Communication Channel should be configured to handle ‘Multiple iDocs in Same XI message’. iDoc sender adapter Communication Channel Configuration for iDoc collection. iDoc collection setting in partner profile. Transaction we20. What Are the Different Types of User-Defined Functions? Single Value, All Values in Context, All Values in Queue. What Is the Purpose of EDI Separator? EDI separator is an adapter provided with B2B Toolkit. EDI separator splits bulk (batch) EDI messages to individual EDI messages for processing. EDI Seperator supports EDI message format ANSI ASC X12, Edifact, Odette, and VDA. What Are the Standard Node Functions Used in Extended Receiver Configuration? What Are Data Type Enhancements and How Do You Configure Data Type Enhancements? Read my article on Data Type Enhancements. How Do you Search for the PI Message of an Inbound iDoc if You Know the iDoc Number? PI message ID can be found in the iDoc Control record. 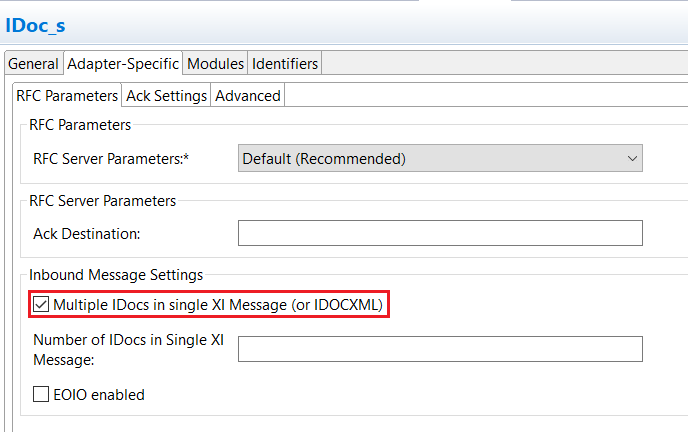 Find the PI message ID in iDoc Archive Key of iDoc control key. Search for the PI message in Message monitor using the message ID. If you have configured iDoc Monitor in SAP PI, you can search for the PI message directly using iDoc number. How Do You Configure AS2 Adapter Certificates? AS2 certificates are installed in Key Storage of Netweaver Admin (NWA). Public certificates of PI host and third party systems are exchanged and installed. In PI, keys are installed as a combination of Key Store View and Key Store Entry. How Do You Set up a SAP ABAP System in System Land Scape Directory? Usually, SAP technical systems are installed in SLD by BASIS team. You need to create the Product, Software Component Version, and Business System of the SAP system. What Is the Functionality of Service Registry? Service Registry is the central location for webservices. Service Registry allows us to expose webservices of PI (host) in accordance with Service Oriented Architecture (SOA). Read how to configure service end points in SR.
What Is the Purpose of Local Software Component Versions (SWCV) and Their Limitations? Local SWCVs are used to test message mapping programs. Objects in local SWCVs cannot be used in end-to-end integration scenarios or viewed in Integration Directory (ID). How Many SWCVs Are Required to Build an Interface with One Sender and One Receiver? I prefer to use Three Tier Architecture to represent an integration. One SWCV for Sender, one for Receiver, and another one for cross-system objects, such as Message Mapping and Operation Mappings. What Is the Difference Between Business System and Business Component? Previously known as Business Service, Business Component is an abstract representation of a system in which attributes are unknown or partially known. Business System, on the other hand, represents a known system in SLD, for example, internal systems in the organization landscape. Business systems require underline Technical systems. All SAP systems should be represented as Business systems. To summarize, prepare for the interview by understanding the concepts, not by memorizing the answers to interview questions. I hope these tips help you to land the job you are dreaming of! All the best for the interview and do let me know how it went afterwards! If you have more questions, comment below! SAP Integration Hub Copyright © 2019.